Click here to go back to Nisim B'chol Yom. Click here to go forward to Ashrei. This blessing is different from the blessing before the ritual reading from the Torah during the Torah service. This is the blessing we use before studying the words of Torah to discuss and discover their meaning. In Jewish tradition, studying is not something we do just to become more knowledgable or to know how to behave later on. Judaism teaches that study is itself a spiritual act. By studying we become closer to God and closer to our ideal vision for ourselves. We make a blessing before we study Torah to remind ourselves that we are not studying this ancient text just because it is historically significant (even though it is), just because it is literarily magnificent (even though it is), and not even just because it helps us understand Jewish law (even though it does). 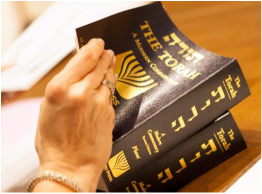 We study Torah because it sanctifies our lives and helps us discover meaning and purpose in life. Studying Torah draws us closer to God.